IT turned eleven at the beginning of last month. It has been an extremely busy few months for him since school started, he's been telling me he feels so tired almost every weekday. He can finally take a breather after today, I hope next school term will not be as busy for him. 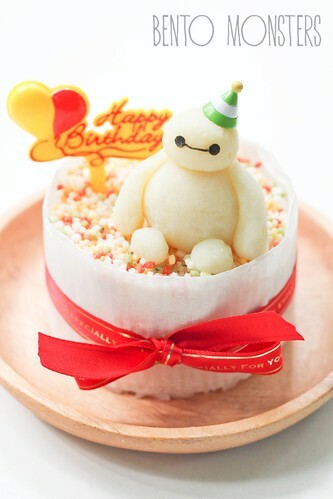 I made this Baymax birthday sushi cake for IT's 11th birthday. How did those eleven years flew by in the blink of an eye? It seems like it was just yesterday he was a baby in my arms and now he is as tall as me. He's still as sweet to me but I'm dreading the coming teenage years, which I foresee will be a huge challenge. This Baymax sushi cake was a last minute idea. 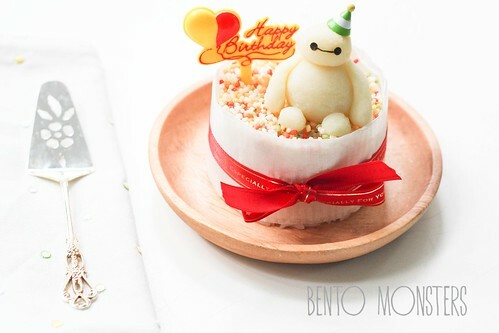 I wanted to make him a sushi cake, but we were hardly at home that week due to IT's busy schedule, thank goodness Baymax came to mind, we like him and he's so easy to make. I also cooked his favourite chicken karaage and fried prawns that day. Baymax was made of mashed potatoes and nori. 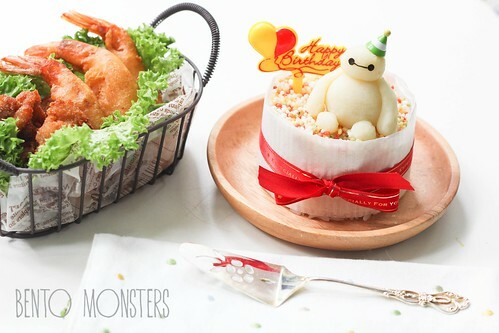 You can click HERE to see how to mould characters using mashed potatoes. The birthday cake for IT, which I baked over two nights, because I did not have time to do so in the day. I baked the cake one night, and assembled it the next night. 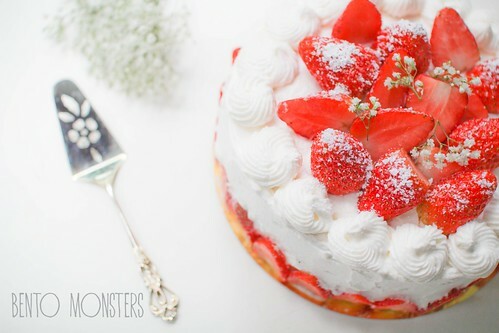 If you have been following my blog these few years, you will know that my boys always ask for strawberry shortcake for their birthday without fail. And I never make much improvement in my frosting every year, lol. 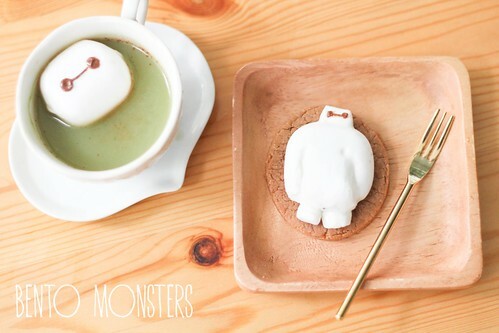 I did not make this Baymax cookie for IT's birthday, but since it's Baymax and IT was the one who ate it, I'll update it in this post. 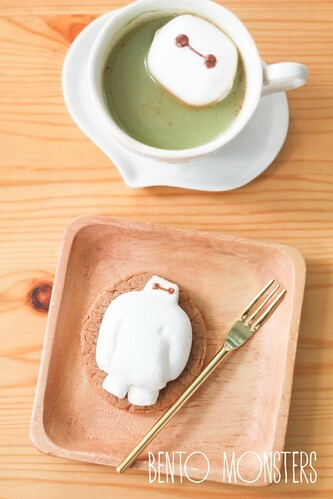 I got the idea for this Baymax marshmallow cookie from Youtube. The slightly melty marshmallow tasted very good with the cookie, I know because I made one for myself too, but did not bother to decorate mine. Love the sushi cake, so neatly done! 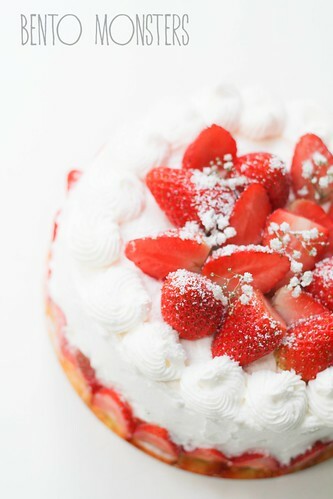 Your strawberry shortcake looks fabulous! wow! everything so beautifully made ^_^ You're amazing Ming! Hi! I just came across your blog yesterday and i love all of your sushi birthday cake ideas. 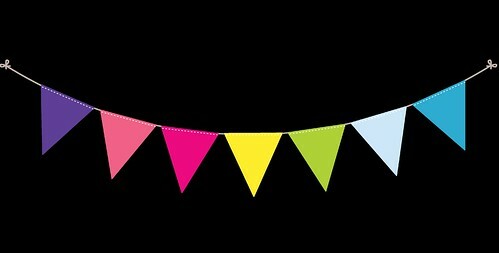 I'm planning to make one for my parents' upcoming birthday but I'm still a little bit confused. So can you please help me by answering these? - How and how long can I store the mashed potato after shaping? I think it will dry out in the fridge but I have to prepare those details beforehand because I don't have time to finish the cake at once. - What kind of paper did you use to wrap around the cake? Well I really look forward to see your response. Anw thank you a lot for sharing amazing ideas and wish you luck and happiness!